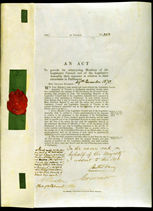 With this document, assented to by the Governor on 29 December 1870, Victoria became the first of the Australian colonies to introduce payment of Members of Parliament. Payment of Members of both Houses of the Victorian Parliament was one of the steps towards parliamentary democracy in Victoria. These include the introduction of the secret ballot by the Electoral Act in 1856, manhood suffrage and the abolition of property qualifications for members of the Legislative Assembly in 1857, and elections every three years in 1859. In contrast to the popularly elected Legislative Assembly, the Legislative Council remained dominated by a squatter and merchant oligarchy. Payment of Members of Parliament was one of the demands of the Chartists, the popular British reform movement of the 1840s which influenced democratic reform in the Australian colonies. Until this Act was passed in 1870, only the Ministers and presiding officers of the Parliament were paid. Democratic reformists argued that this worked against popular representation. Athough all men could vote, only wealthy men could afford to sit in Parliament. Payments were fiercely resisted by the conservative Legislative Council, and were introduced in 1870 as a temporary measure, which later became permanent. Wright, Ray, A People's Counsel: A History of the Parliament of Victoria 1856–1999, Oxford University Press, Melbourne, 1992. 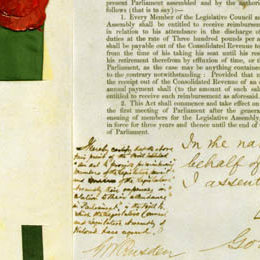 This detail on the title page of the Payment of Members Act 1870 (Vic) shows the handwritten assent to the act and signatures of the Governor and Clerk of the Parliament. Features: This document is more formally presented than early Assent originals of Victorian Acts. It is tied with a 3.5 cm green ribbon stamped with the red seal of the Parliament and is signed by the Governor and the Clerk of the Parliaments.